1870 Company established by Joseph Jonas and Robert Colver. 1878 Advertising their tool steel, drill rod, and 'Continental' needle wire, etc in the USA. Agents for USA and Canada: M. Diamond & Co. US Warehouse: 8 Ford Street, Hartford, Conn.
1892 Incorporated as a private limited company. 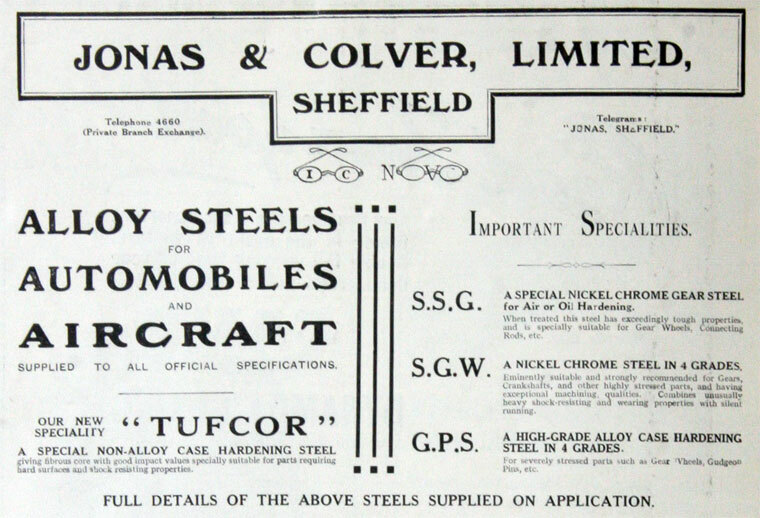 1903 Mr B. Hunstman wrote to The Times pointing out that Ajax steels from his company and steels from Messrs Jonas and Colver, probably the largest producer of high speed steels, were of comparable quality to those of Armstrong Whitworth for tool making. 1907 Re-registered as a private limited company. Presumably at this time was renamed Sir Joseph Jonas, Colver & Co., Ltd.
1974 Designed a new carbide face milling cutter which removed large amounts of metal using a new tool geometry. This page was last edited on 11 February 2019, at 13:54.